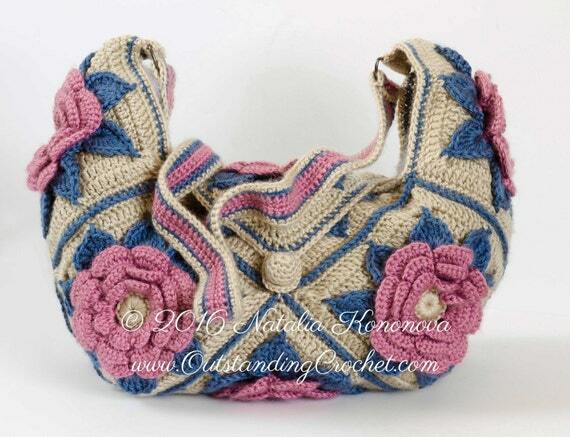 Outstanding Crochet: New crochet pattern - Hippie Boho Festival Shoulder Bag. 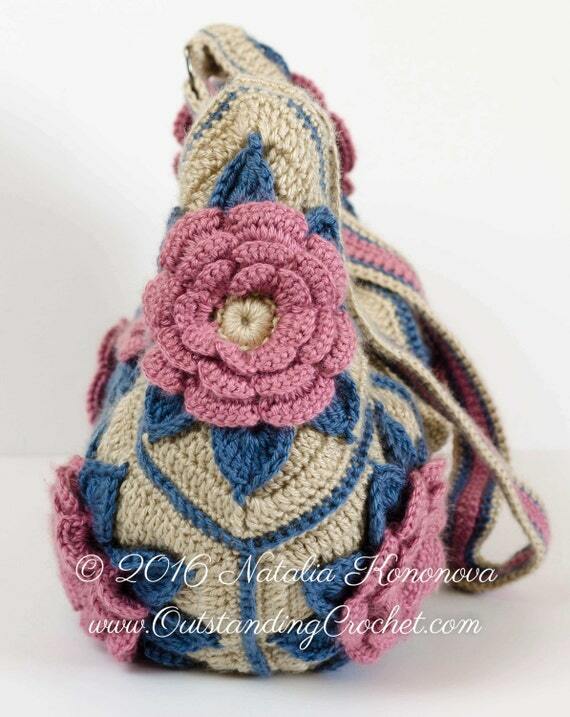 New crochet pattern - Hippie Boho Festival Shoulder Bag. Miss 70s? In love with Boho Chic or Hippie Style? This bag is for a person, like you, who prefers life in many colors! 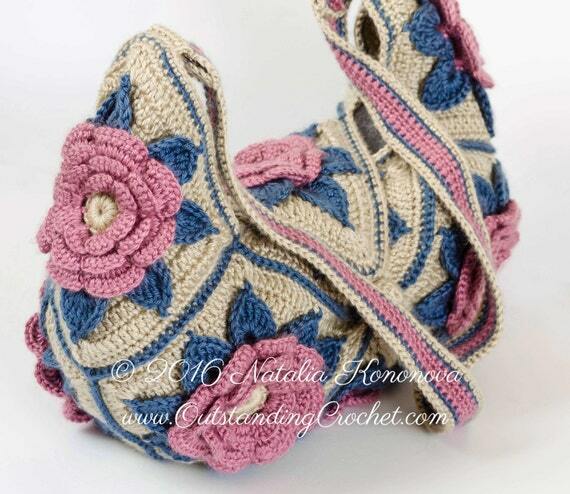 Follow by e-mail (right upper corner) to receive free patterns, tutorials and new patterns in the shops announcements! Follow my Facebook or Twitter. Follow Pinterest to see a lot of designer crochet wear from around the world. ch (chain), sl st (slip stitch), sc (single crochet), fpsc (front post single crochet), hdc (half double crochet), dc (double crochet), tr (treble crochet). - Worsted weight yarn: 1 skein (100 g) in color for flowers - F, 1 skein (100 g) in color for leaves - L, 3 skeins (300 g) in background color - BG. Show here: Caron Simply Soft Yarn (100% acrylic, 170 g/6 oz/288 m/315 yds, worsted weight - #4) - 1 skein in 9609 Berry Blue, 1 skein in 0005 Blackberry, 2 skeins in 9703 Bone. - 20 mm in diameter 1 wooden bead. - 2 D-rings for attaching handles. - Square motif side is 6 ¾'' (17 cm). Bag is about 18'' (46 cm ) wide and 15'' (38 cm) tall (without handles). Handle is about 15 ¾'' (40 cm) long.